Rumours of the Marvellous by Peter Atkins includes fourteen of the writer’s best stories. Limited to 250 signed and numbered copies, features an introduction by Glen Hirshberg, a cover painting by Les Edwards. Co-published by The Alchemy Press and Airgedlámh Productions. 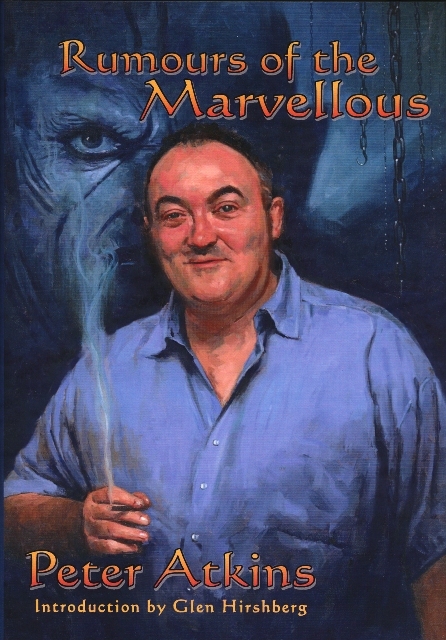 “Rumours of the Marvellous is a superb collection of short stories by Peter Atkins that fall in the borderland between SF, fantasy, horror and the super­natural.” — David V Barrett, Fortean Times, November 2012 issue. “In a collection as consistently inventive and strong across the board as this one is, it’s difficult to point to stand-out stories. What it does show above all, however, is that the best writers are those who take the base material of what’s gone before, wilfully dissolve it and then set about recombining it into something absolutely new and marvellous. It isn’t difficult to see where Mr. Atkins has done just that, but here we witness him working truly wonderful alchemy on that undifferentiated material, which results in literary gold.” – Simon Marshall Jones. Read the full review on the This is Horror website. “… it’s a real treat to have these stories side by side as they stretch back from 2011 to 1992. I won’t spoil your enjoyment by highlighting particular ones, suffice to say that you are in the hands of one of the best and most original writers of horror and dark fantasy to come along in the last twenty years; but Atkins is also a great stylist with a truly original voice, so be prepared to be entertained, enlightened and educated in the fine art of short story writing.” – Ian Hunter on the BFS website. “I can’t make my mind up what impresses me most about Peter Atkins’ work: his writing style; his ability to paint believable characters and locations with such brevity, then turn on the subtle surrealism; or his incredible originality – you will find nothing in here that’s like anything else. Peter Atkins doesn’t do imitations: he and his fiction are totally unique, and I wish he’d write tons more of it for us to savour. Very highly recommended indeed!” – Paul Kane on the Mass Movement website. Copies are also available from Amazon from several dealers, including The Alchemy Press. US customers can obtain copies from Amazon.com.